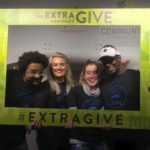 We hope to see you at one of our three events on Extraordinary Give Day. Come have breakfast on us at our facility at 1085B Manheim Pike from 6am-noon or meet us for a party at Tabor Community Services in the early evening with bands and food trucks from 5pm til 8pm, or if you’re a night owl join us downtown Lancaster at the Marriott for the big Lancaster County Community Foundation event. Meals on Wheels of Lancaster has participated every year since the first year and we are glad to be one of those trailblazing organizations that took a chance on an event that was so different than anything previously attempted in Lancaster. The money that has been raised over these past few years has primarily been used to help ensure that financial hardship is not keeping one of our homebound neighbors from receiving the nutrition they require delivered to their door. We continue to grow and are grateful for the opportunity to serve a wider part of our community geographically as well as numerically. We have continued to increase the amount of from-scratch cooking that comes out of our facility as well as local produce. We aim to cater the highest quality possible and we believe we are really hitting our stride. This upcoming year we are also cognizant that we need to do more. We need to serve in more ways and with more deeper connections. This Fall we started to partner with area churches to help with some cleaning and housework that some of our clients no longer can do. We continue to yearn for an evening visitation program. We also continue to develop a Vegetarian and an International Cuisine line. These innovations take the kind of resources our program doesn’t generate on its own for development. Unlike a for profit company, though, we don’t have stock investors. Instead, we have you. You the community are our investors and we welcome you to come invest in us so that our community can be the beneficiary of the dividends we aim to produce. Thank you for your support both today and all days of the year.